The USS Fulton AS-11 was launched on December 27, 1940 at the Mare Island Navy Yard in San Pablo Bay, opposite Vallejo. Vallejo is approximately 30 miles north of San Fransisco. 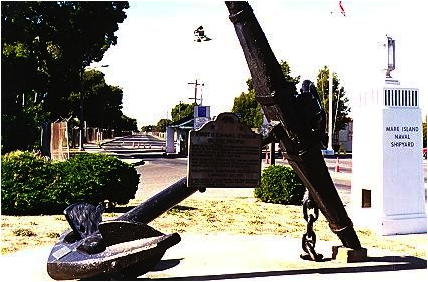 The Mare Island Navy Yard opened in 1854 and was the first U.S. Navy Shipyard on the Pacific coast. The Facility was decommissioned on April 1, 1996. Shown below is the entrance to the Mare Island Naval Shipyard. The USS Fulton was sponsored by Mrs. A. T. Sutcliff, great granddaughter of Robert Fulton, and was commissioned on September 12, 1941. The USS Fulton, AS-11, was the fourth ship of the United States Navy to be named in honor of Robert Fulton, inventor and ship designer. to prepare for Pacific duty. She tended Pacific Fleet submarines at Pearl Harbor from March 15, 1942 to July 8, 1942 putting to sea during the Battle of Midway. The USS Fulton was at Midway until October 17, and then sailed for Brisbane, Australia arriving on November 9. At Brisbane the USS Fulton established a submarine base and rest camp, and in addition to refitting submarines between their war patrols, acted as tender to other types of ships. The USS Fulton also played an important role as support tender for submarines engaged in experiments and tests of sonar mine detection devices which enabled American submarines to successfully penetrate the minefields guarding the Inland Sea of Japan. I'm a volunteer at the MacArthur Museum in Brisbane, Australia. The museum is located in the building where General MacArthur's office was located while he was in Brisbane. 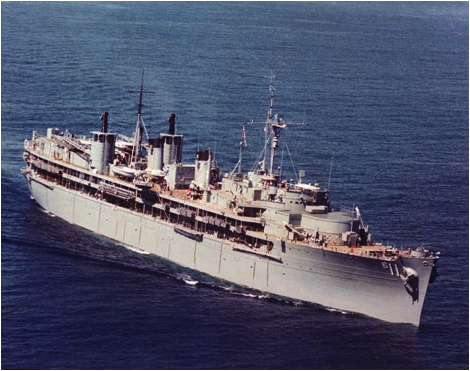 At the moment, I am undertaking some research for an article I am writing for the museum's quarterly magazine on US Navy 134 where the Fulton was based for a while during the Second World War and came across your website. I notice that you have an uncaptioned pic of the USS Fulton on your website. 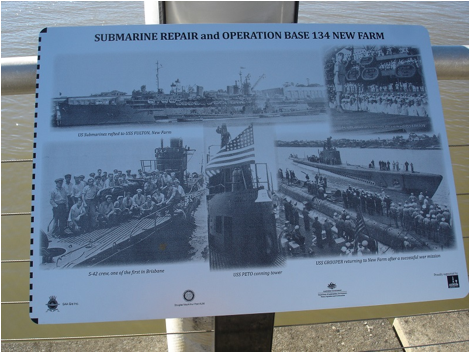 It would have been taken while it was acting as a submarine tender at New Farm wharf, which is where US Navy 134 and submarine task force 42 (later 72) was based. You also might be interested in the fact that the Fulton is acknowledged in the Submariners Walk Heritage Trail which was opened in 2013. The walk runs along what was New Farm wharf the submarines and their tenders were moored. I'm attaching a copy of one of the plaques which has the same pic of the Fulton on it. Milne Bay, New Guinea, was the Fulton's station from 29 October 1943 until 17 March 1944, when she sailed for a west coast overhaul. Returning to Pearl Harbor 13 June 1944, Fulton gave her tender services to submarines there for a month, then at Midway between July 18th and September 8th, and then at Saipan until April 25,1945. 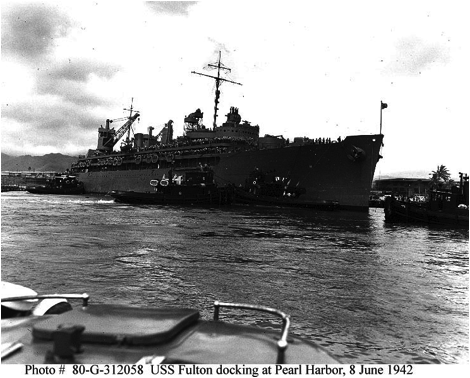 The USS Fulton then returned to Pearl Harbor from May 7th to June 9th, and then sailed for Guam, where she refitted submarines for the last patrols of the war. 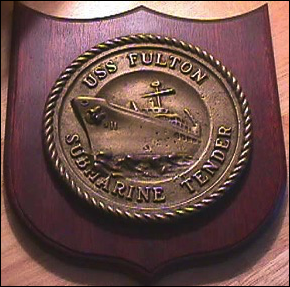 The USS Fulton received one battle star for her World War II service. After a west coast overhaul, Fulton then served as tender at Pearl Harbor from February through May of 1946. The USS Fulton participated in the Operation "Crossroads," atomic weapons tests at Bikini in the Marshalls Islands that summer. In addition to caring for the six submarines assigned to the project, she acted as repair ship for other vessels in the task force. On September 18, 1946 Fulton arrived at Mare Island again, where she was decommissioned and placed in reserve on April 3, 1947. 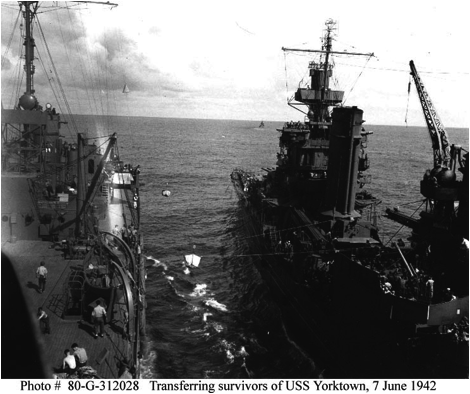 Her wartime service record tallied 332 vessels repaired and serviced. Recommissioned on April 10, 1951, the USS Fulton sailed 3 weeks later for New London, her homeport through 1991. The USS Fulton's subs now included the Sea Wolf, the Skate, and the Nautilus - making Fulton the first Tender to support Nulaa Fast Attack Subs. Her primary assignment was as the tender for Submarine Squadron 10 at New. London, but she occasionally relieved the tender Orion (AS-18), at Norfolk. The USS Fulton also allowed her sailors to earn "seapay" by participating in exercises from Newfoundland and Iceland to the Caribbean. She first crossed the Atlantic in the fall of 1957 for Operation "Natoflex," visiting Rothesay, Scotland, and Portland, England. A heightening of her responsibility came 1 April 1958, when three nuclear submarines were assigned to her squadron. In August, Fulton sailed to New York for the celebration of the arrival of Nautilus (SSN-571) from her historic submerged passage under the North Pole. bridge over the River Thames in the background. Squadron Ten were the USS Fulton, AS-11; USS Skylark, ASR-20; USS Gato; USS Nautilus; USS Greenling; USS Pollack; and USS Sturgeon. In 1972 Fulton made a 5 month deployment to the Mediterranean, at LaMaddalena, Sardinia. Fulton's mission was to prepare for full time use an advance refit site for nuclear fast attack submarines. This was the first deployment of a WWII vintage submarine tender to the Med since WWII. 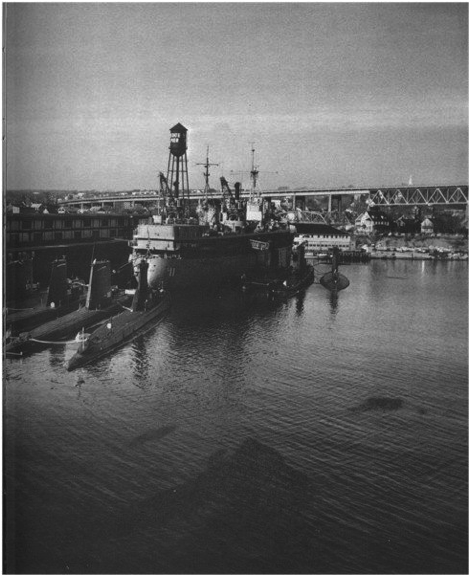 After a shipyard overhaul in 1976, Fulton returned to New London to continue support of Atlantic Fleet submarines. Fulton was again modernized in 1983-1984 with an extensive overhaul at both Electric Boat,Groton, CT, and General Dynamics, Quincy, MA. While at Quincy a fire started in the After Engine Room in an electrical panel when it was re-energized at about 0830 (the panel was wired incorrectly by the shipyard). It quickly spread to the cork lagging which had about 45 years of oil and paint in and on it. The crew performed quickly and well, and soon had the fire under control. The ship did not return to EB for repair, repairs were accomplished at Fore River. In late 1984, Fulton attended REFTRA (refresher training) at Guantanamo Bay, Cuba. Then on January 3, 1985, the Fulton got underway for LaMaddalena, Sardinia to relieve her sister tender (AS-18) Orion of her maintenance responsibility, to allow a pier-side SRA period for Orion's overhaul. During this underway period, she visited Barcelona and Palma Spain, and Bergen, Norway. The USS Fulton returned to New London May 10, 1985. She was underway 128 days, and traveled over 11,000 miles without incident. From May 1985 through January 1988, Fulton remained the flagship of ComSubron-10, tending submarines at State Pier. There were short underway periods throughout this period, including a deployment to Puerto Rico for "sub rescue operations". About half way there, the sub which was in trouble was okay, but Fulton completed the transit, staying only about 4 or 5 weeks. Other port visits during this period included St. Johns, New Brunswick, Ft. Lauderdale, FL, and Annapolis, MD. to attend graduation ceremony at the U. S. Naval Academy. In January 1988, Fulton again found herself undergoing another SRA rehab period in a drydock at Norshipco in Norfolk, VA. Extensive berthing rehab, sandblast of the hull below the waterline, and other repairs were conducted. In March 1988 after a port visit to New York City during Fleet Week, the USS Fulton again returned to New London to tend submarines as the ComSubron-10 flagship. She visited Bermuda in a two week workup for an Operational Propulsion Performance Evaluation and passed with flying colors. Fulton remained in New London until her decommissioning in 1991. Decommissioned, 30 September 1991. Struck from the Naval Register, 20 December 1991. Final Disposition, sold for scrapping, 17 November 1995, by the Defense Reutilization and Marketing Service. 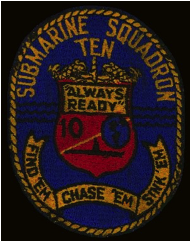 In 1988 Submarine Squadron TEN, of which FULTON was the flagship, included the USS JACK (SSN-605), USS TINOSA (SSN-606), USS WHALE (SSN-638), USS GREENLING (SSN-614), USS GATO (SSN-615), USS PARGO (SSN-650), USS TREPANG (SSN-674), USS BILLFISH (SSN-676) and the Torpedo Retriever TWR-681. Length: 530 ft. 6 in. Beam: 73 ft. 4 in. Max Height: 124 ft. 10 1/2 in. Draft: 22 ft. 5 1/4 in. Captain J. S. Coye jr.